My parents recently purchased a gorgeous old New England hilltop farm near where I grew up. I had a chance to visit this summer and it felt like a vacation home, rather than visiting my parents. In addition to a really nice tract of land, the house came with an old historic cow barn. I was unfortunately pretty low energy during my visit, but I did get out one morning to do some photography. I tried my best to capture some of what makes this place so special. The light and number of subjects were pretty limited the one morning I had a chance to go out. I'm not sure I was entirely successful, but I'm looking forward to returning and trying again. 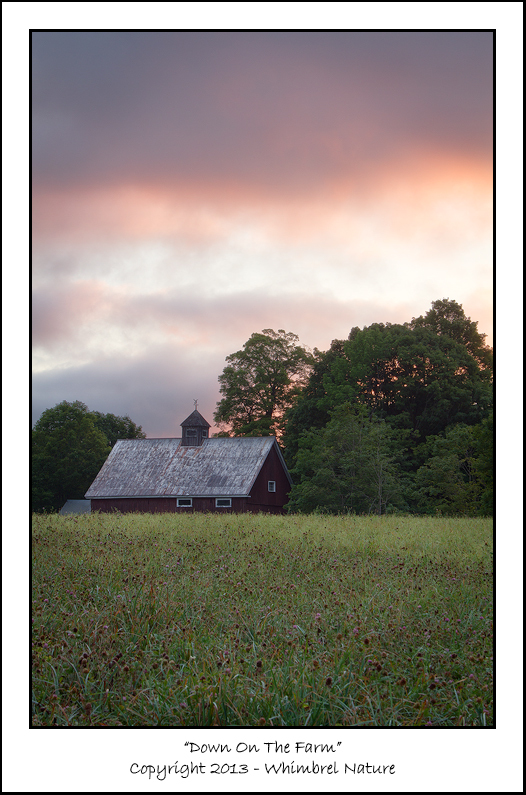 The first image was taken from the middle of their hay field, looking back towards the barn (the house is out of view to the left). Even though it was a rather cloudy and stormy sunrise, I had to expose this image in two steps to get both the foreground and the sky exposed correctly. Otherwise, I would have ended up with a blown out sky or a severely underexposed foreground. I hand-blended the two images in Photoshop using the lighten mode and a channel mask (using I think the blue channel) that I then adjusted using levels and maybe a bit of brush work. 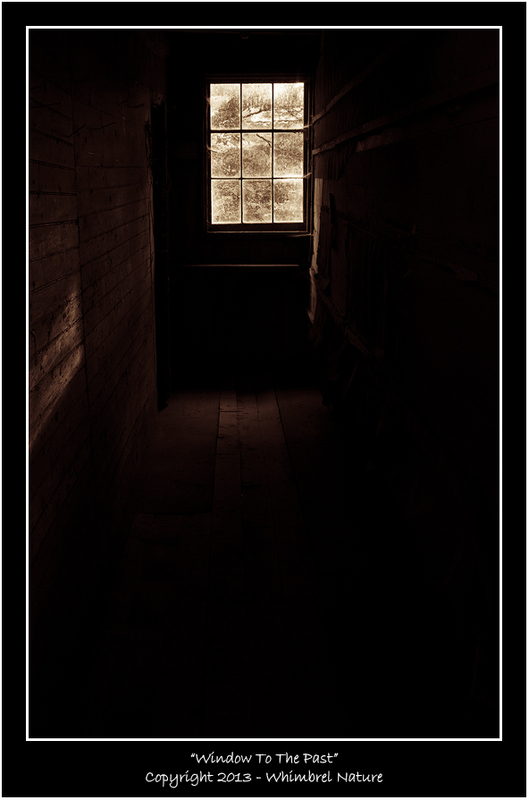 This one was taken inside the old barn and was a perfect candidate for a black and white treatment. It was really the quality of the light and the pattern that attracted my attention. The planks and walls themselves were a mismatch of cobbled together old wood, new wood, painted wood, tar paper, and the like and wouldn't have been as visually pleasing in color. Like most of my black and white images, I did pretty much all of the processing inside of Lightroom. I started with one of the black and white presets and then adjusted from there. I actually liked what the sepia preset did with this image, but I thought a split tone with some more red in it did more justice to the mood I was trying to convey. This last one I definitely want to come back to. 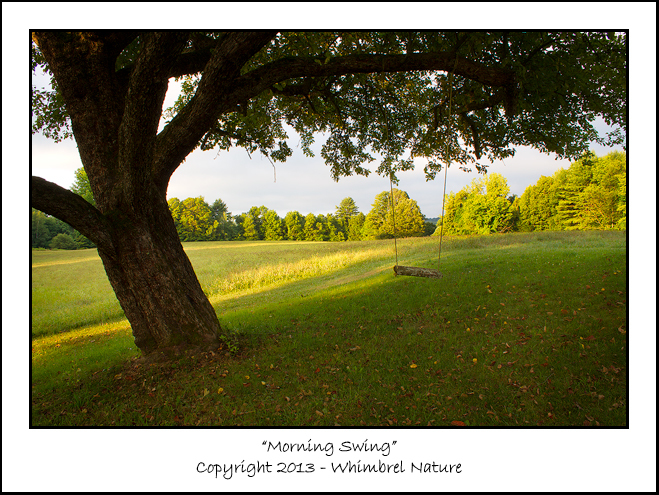 This shapely old tree with the old lichen-covered swing makes a very attractive composition. However, the light and sky on this particular morning just wasn't what I was looking for. I had visions of possibly doing a light painting with a full-moon lit landscape or with a starry sky, but a combination of the weather and my energy levels kept me from trying it out. So perhaps next time. For this image I again hand-blended two images; one exposed for the sky and the other to capture a bit more detail in the tree and in the shadows. It really IS a special place. You can 'feel' it right through the pictures. Very much enjoy the blog and photography. Wow, what a wonderful place to photograph Elijah! I love the image from inside the barn the most, guess it shows that I am a farmer's daughter. Beautiful place and beautifully photographed!